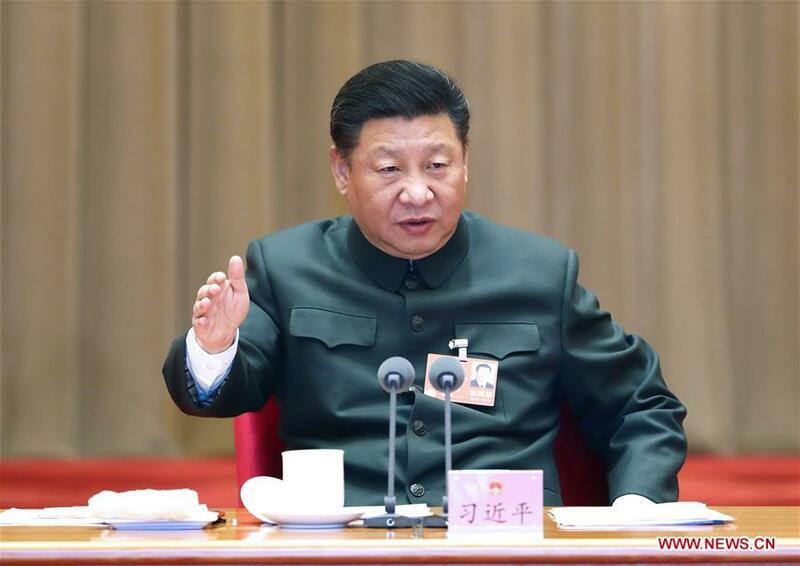 BEIJING, March 12 (Xinhua) -- President Xi Jinping Monday stressed practical efforts to further deepen military-civilian integration to provide impetus and support for realizing the Chinese dream and the goal to build a strong military. Xi, also general secretary of the Communist Party of China (CPC) Central Committee and chairman of the Central Military Commission, made the remarks when attending a plenary meeting of the delegation of People's Liberation Army (PLA) and armed police at the ongoing session of the 13th National People's Congress, the national legislature. "Implementing the strategy of military-civilian integration is a prerequisite for building integrated national strategies and strategic capabilities and for realizing the Party's goal of building a strong military in the new era," Xi said. He called for efforts to promote military development featuring higher quality, efficiency, and scientific and technological levels. Highlighting coordinated sci-tech innovation in key areas between the military and civilian sectors, Xi asked related parties to promote integrated reasoning and implementation on key sci-tech projects and race to occupy the strategic high ground in terms of sci-tech innovation. China has achieved a revolutionary restructuring of the military organization and services amid deepened reform on national defense and the armed forces since the 18th CPC National Congress in late 2012, Xi said. Xi said efforts should be made to speed up the establishment of a modern military policy system. He ordered the military to firmly support the Party and the country's institutional reform and ensure reform tasks concerning both the military and civilian sectors well implemented. He said efforts to build the system of rule of law in Chinese military should be strengthened. Xi asked every member of the armed forces to uphold the Constitution, and be its loyal supporter, active follower, and firm defender. He said Party committees and governments at all levels should do more to support the cause of defense and military advancement, while the armed forces should render their service to economic and social development.